Miss Frances Simpson was very much the power-house behind the ongoing promotion and development of the Blue Persian variety in long-hairs. She was in fact, the owner of the first Blue Persian in the National Cat Club register, namely 'Bluette', born 18th September 1889. 'Bluette' is, registered under the number 1003, and was therefore only the third cat to be recorded by the then fledgling registry! Miss Simpson was also jointly responsible for further promoting the breeding of 'blue to blue' to establish a 'pure blue' strain, consistent in coat colour and sound in eye colour. So it does seem a little incongruous that in this case, she chose to bring in a blue male, who was out of a black female. 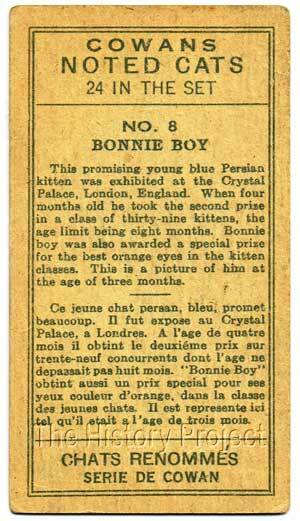 But 'Bonnie Boy' obviously brought perhaps both the two qualities most sought after in a blue, that light even colour and the deep orange eyes. Of the reasoning, we can only surmise, but we should not doubt her judgment when it came to a Blue Persian as this was her 'specialist' field of knowledge. Certainly from his kitten photo, the coat appears to be extremely pale and exceptionally even in colour. By 1901, a number of specialist societies were being established, the first and foremost among them being the Blue Persian Cat Society, established on 24th April, 1901, making it the oldest Specialist Club still operating in the world today! Before the end of its second year, it could boast a membership of almost two hundred. The incomparable Miss Simpson was its founding Honorary Secretary, a position she held for several years, during which time she made absolutely sure that Special Awards donated to shows in the name of the Society were offered in Classes at all major and some minor shows, further promoting competition and recognition for this burgeoning variety. She also campaigned for the larger shows to break down the Classes offered to male and female, in both the adult and kitten Classes, and then to break them down further , into age groups, as the number of entries continued to increase. As a self-appointed 'guardian' of the Blue Persian, she is unquestionably without parallel. Our access to any definite information about the origins of 'Bonnie Boy' are limited and we can only speculate on what we have available to work with. His date of birth is not known, but from Miss Simpson's commentary as to his age when first shown successfully, we can surmise that his date of birth would have been in the vicinity of circa June/July 1901. Although he does not appear in any register, we are told that his dam was a black Persian owned by Mrs. H. B. Thompson, (Islington cattery), which means he was very likely to have been bred by her. 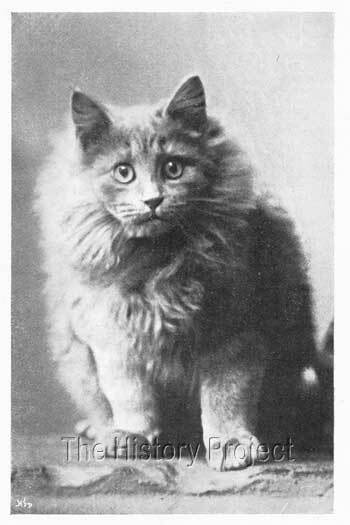 Mrs H. B. Thompson was a committed breeder of Blue Persians, and of Chinchillas and Silver Tabbies and a member of the Committee of The National Cat Club. She owned a good number of studs and had some excellent early lines to work with. 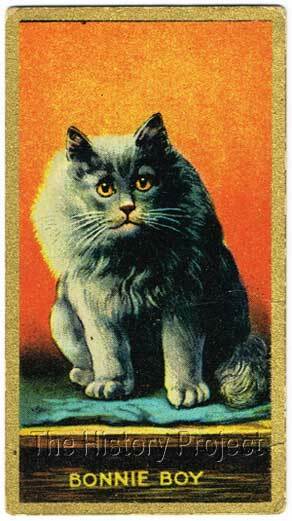 "My 'Bonnie Boy' will sit for hours watching a likely hole, and never a mouse escapes his clever clutches." As Miss Simpson claims ownership of 'Bonnie Boy' within the listings of well-known cats in her book and we have no method of verifying the same, we must take this as an established fact. No information exists on siblings.